This salted caramel popcorn cake will blow your mind and set off fireworks on your tastebuds. 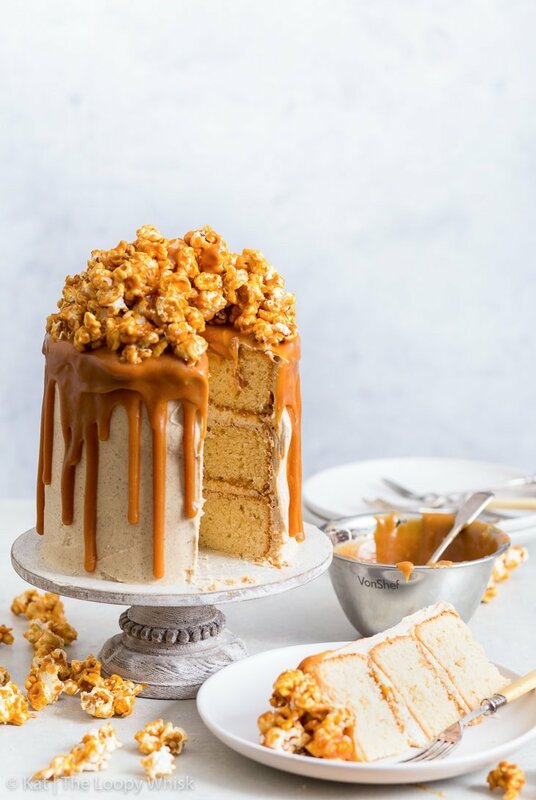 With pillowy soft peanut butter sponges, insanely delicious brown butter frosting, an overabundance of salted caramel and a small mountain of caramel popcorn. Plus, it’s gluten free. Sounds rather perfect, doesn’t it? How much caramel is too much caramel? Asking for a friend. Okay, okay, so I might have gone slightly overboard with the salted caramel drizzle. 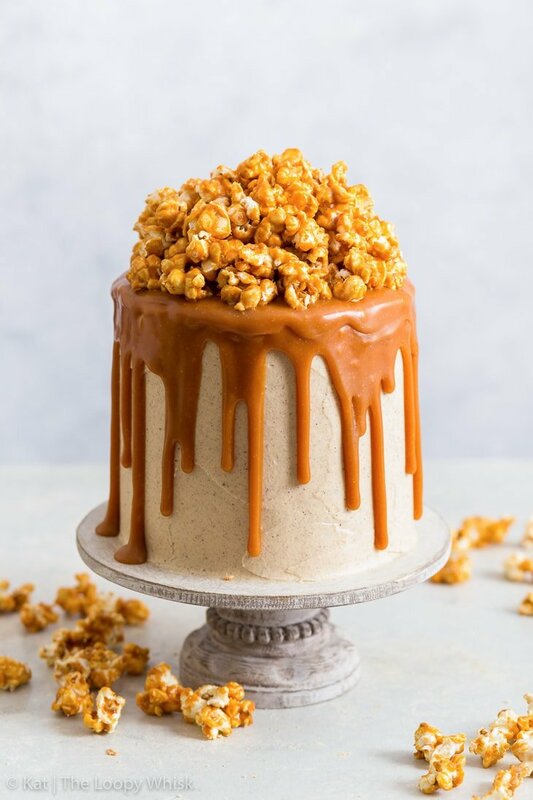 But… if we’re making a salted caramel popcorn cake, we might as well go all out on both the caramel and the popcorn front. Right? Right. Glad we agree. Because there’s no such thing as over the top round these parts (if you didn’t know that before, you do now): we’re also adding peanut butter sponge cakes and brown butter buttercream frosting into the mix. I can just see your brain self-combusting right about now. 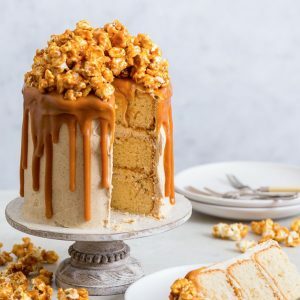 The thing is… each of these components is perfect on its own (I could eat the brown butter frosting with a spoon, and don’t even get me started on the caramel popcorn) – but when they combine together, the results are EPIC. 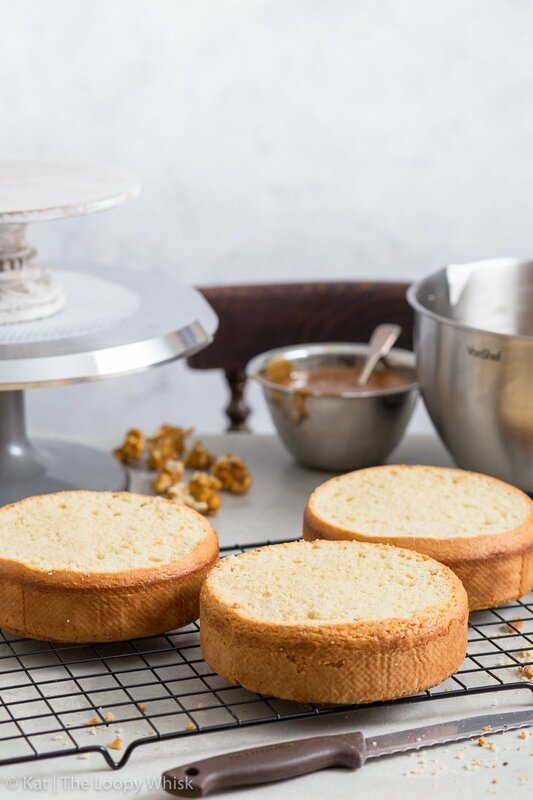 The peanut butter sponge cakes don’t have an in-your-face peanut butter flavour, though you could give them an extra oomph by using peanut butter powder to replace some of the flour. Instead, the peanut butter flavour is gentle and fits seamlessly with the other cake components. The sponges are soft and moist – and gluten free. Just, you know, without being obvious about it. 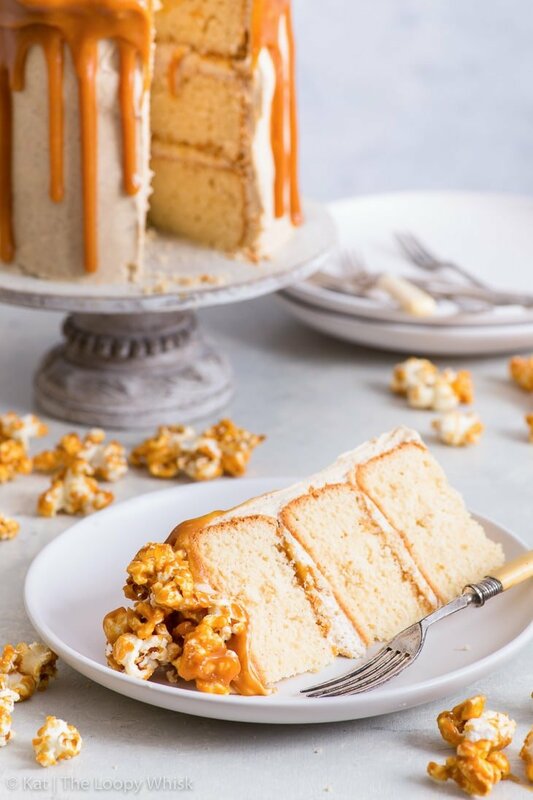 Trust me, there’s not way you can guess this caramel popcorn cake is gluten free. Okay, so we could skip making the brown butter frosting and just make your “normal” buttercream… but we’re way too extra for that. Brown butter is magic. It’s as simple as that. If you’ve never browned your butter before, you’re missing out. 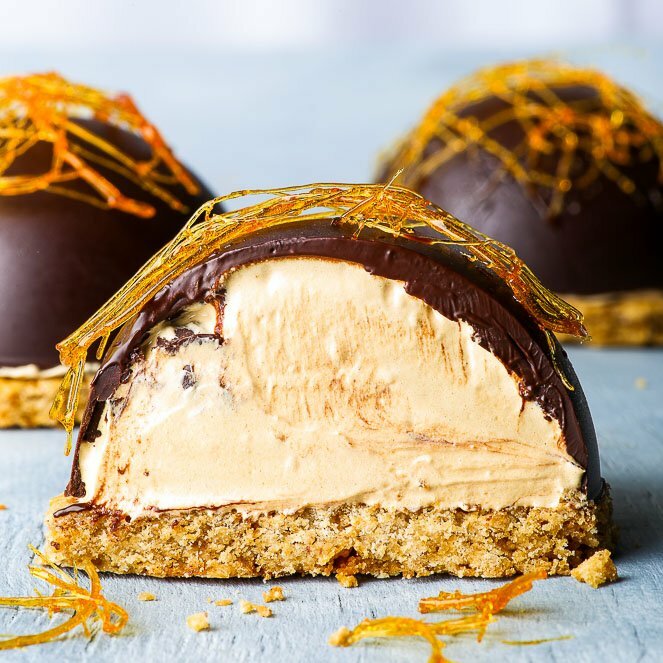 The nutty, caramelised notes pack an insane flavour punch, and when you whip the (cooled) browned butter into buttercream frosting… your tastebuds will thank you. Now, some people will say I’ve gone too far with the salted caramel drizzle. First of all, “drizzle” really doesn’t cover the situation going on here. “Waterfall” would be more accurate. And second of all, everyone loves caramel. And a measly drizzle may be okay for some, but we’re too badass for that. So there. The cake is finished with a small mountain of caramel popcorn, which is dangerous and way too delicious for its own good. 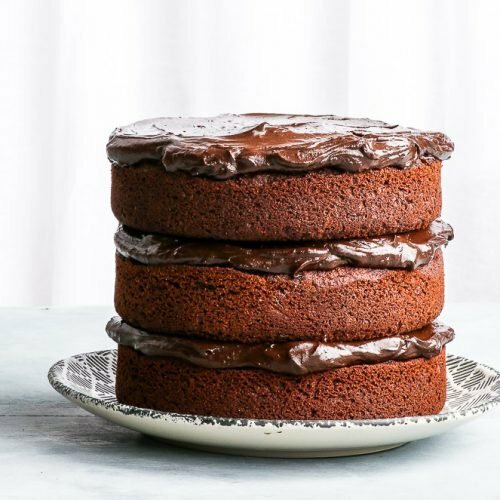 Basically, if you’re looking for a completely outrageous, dangerously delicious GLUTEN FREE cake that may or may not put you in a sugar coma… this is it. And believe it or not, it’s super easy to make! So let’s get baking. First, the sponges. The ingredients are simple, and I bet you have all of them already in your pantry. until you get a homogeneous mixture. and whisk in the butter and peanut butter. I like to do this with my VonShef hand mixer, which does the job perfectly. and whisk away until you get a lovely smooth batter. 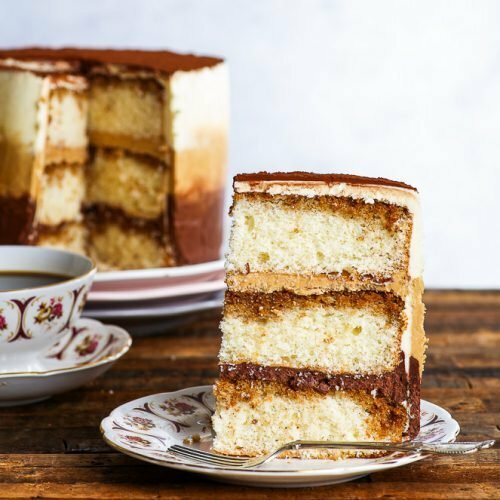 Then pour the batter into your prepared cake tins (behold the lovely ribbons of perfectly mixed batter) and bake until fluffy and golden brown on top. Browning butter sounds way more complicated than in actually is. All you have to do is melt the butter and then let it cook on medium-low heat with stirring, until it starts foaming and becomes dark brown in colour. There will be dark bits floating around, and it might be tempting to throw those away – don’t. They carry SO MUCH flavour, and your buttercream will be all the tastier for them. until it firms up but you can still stir it easily. Then, whisk it up with some powdered sugar and behold the off-white SUPER FLUFFY awesomeness that results. Have a taste. Do a happy dance. So. Good. 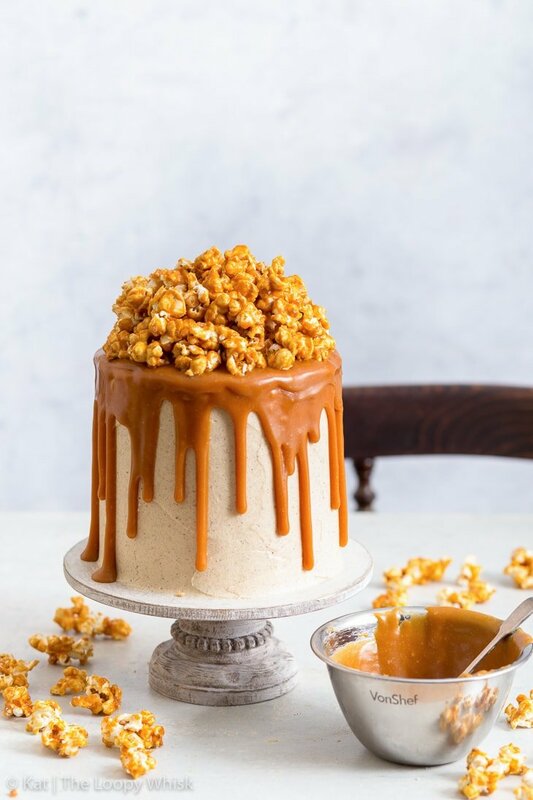 Once we have all the cake components ready, we can get on with putting the salted caramel popcorn cake together and making it ultra-beautiful (in this case: drowning it in salted caramel). Plus, this gives me extra room to show off some pretty photos to you. Don’t ask. It’s a blogger thing. 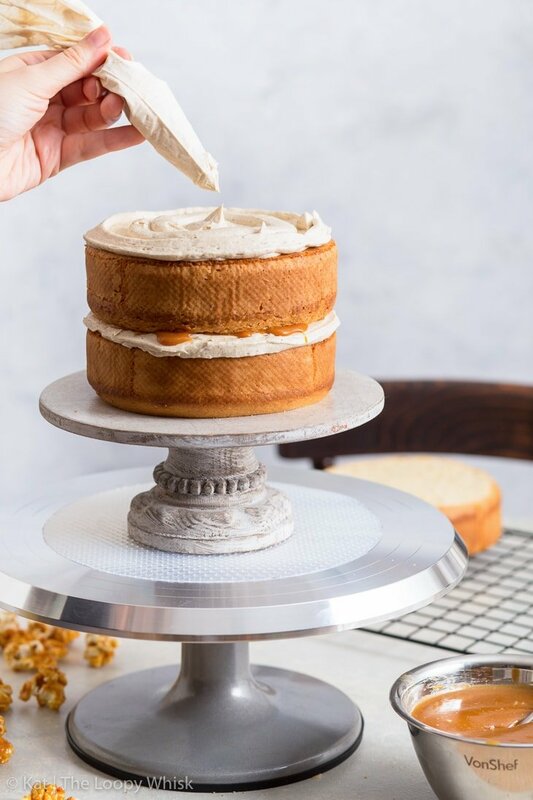 Choose a pretty cake stand, and place it on a rotating cake stand, if you have one. On a side note, I never understood why people decorate cakes directly on a rotating cake stand and then go through all the fuss involved in transferring the cake to the actual cake stand. Placing the cake stand on top of the rotating stand fixes that problem. Yay! 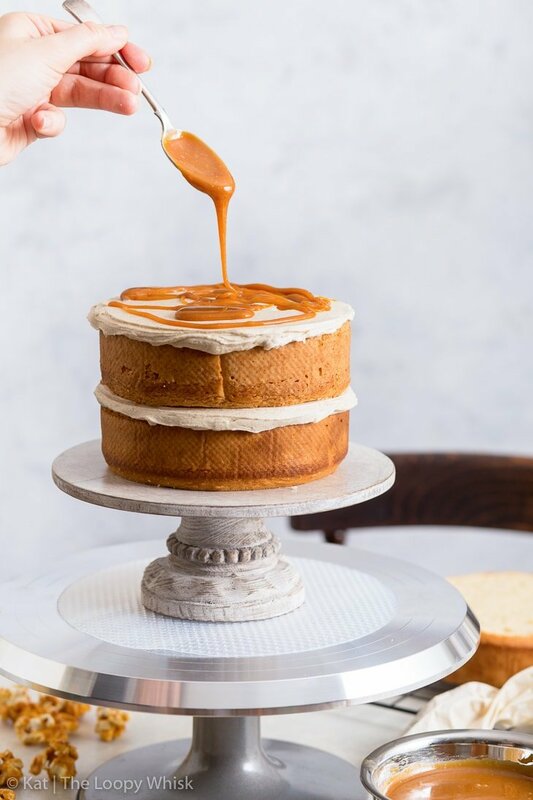 Start with a peanut butter sponge, spread a generous amount of buttercream on top and drizzle with salted caramel. And repeat. Next up, place the final sponge cake on top, and use the remainder of the brown butter frosting to cover the top and sides of the cake. 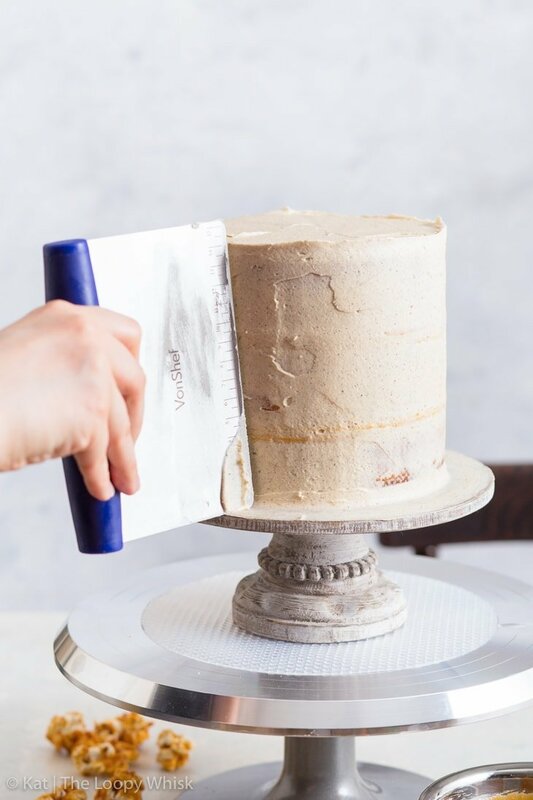 Smooth out the frosting with the VonShef dough scraper and cutter – now, don’t let the name fool you, this handy tool makes the perfect icing smoother. Then, refrigerate the cake for about half an hour. This will firm up the frosting and ensure that we don’t end up with a mess once we get on with the decorating. All that’s left to do now is to smother the cake with ALLTHECARAMEL and cover its top with a mountain of popcorn. Of course, you can be more… sophisticated about it. But I kinda like the slightly rough-around-the-edges look of this salted caramel popcorn cake. It just… really makes me want to eat it. And that’s the only important thing with a cake, right? So there you have it, folks. 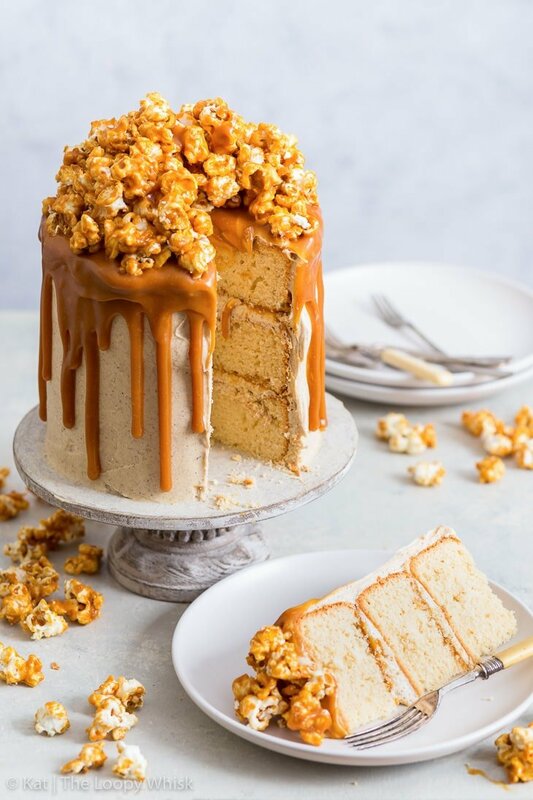 A surprisingly simple to make, 100% gluten free and completely outrageous salted caramel popcorn cake that will steal the show no matter the occasion. 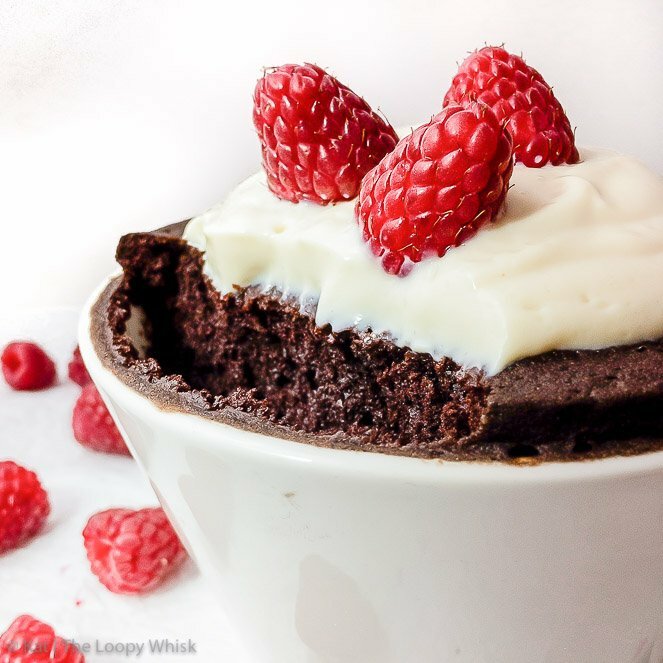 When it comes to baking, there’s NEVER enough mixing bowls. You know what I mean, right? That’s why I love the VonShef 6 piece mixing bowl set – (a) there are SIX mixing bowls, and (b) they go from a teeny tiny one to an absolutely humongous one! You know how getting the frosting on a cake all smooth and straight can be a bother sometimes? Well, an icing smoother solves the problem easily. The VonShef dough scraper and cutter can actually be used for this exact purpose – and it works like a dream! Pre-heat the oven to 355 ºF (180 ºC) and line three 6 inch round cake baking tins with baking/greaseproof paper (see post). In a small bowl, whisk together the milk and eggs until homogeneous. In a separate larger bowl, sift together the gluten free flour, xanthan gum, baking powder, sugar and salt. 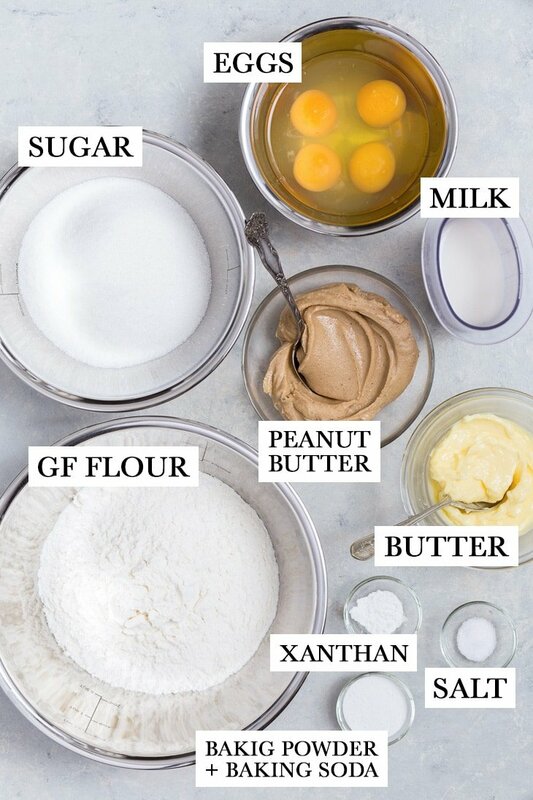 Add the unsalted butter and peanut butter. Using a hand mixer, whisk the butter into the dry ingredients until you get small, pea-sized pieces. 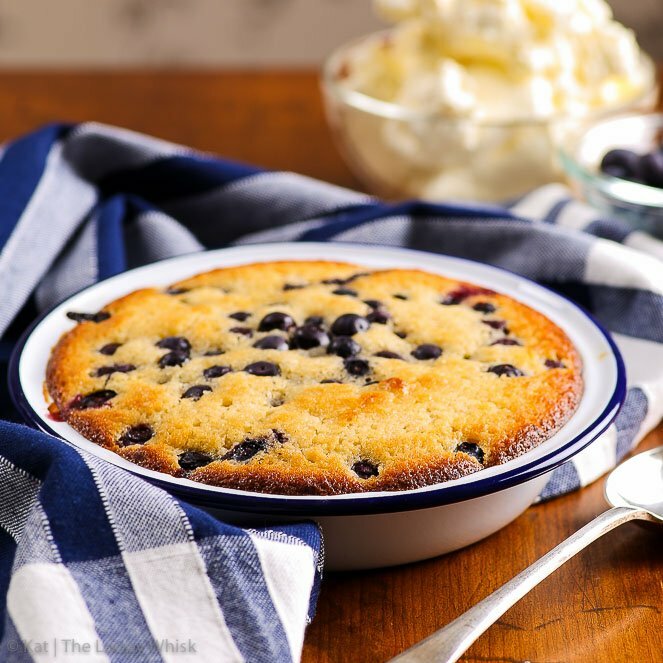 Add the milk+egg mixture and, using a hand mixer, whisk until you get a smooth cake batter. 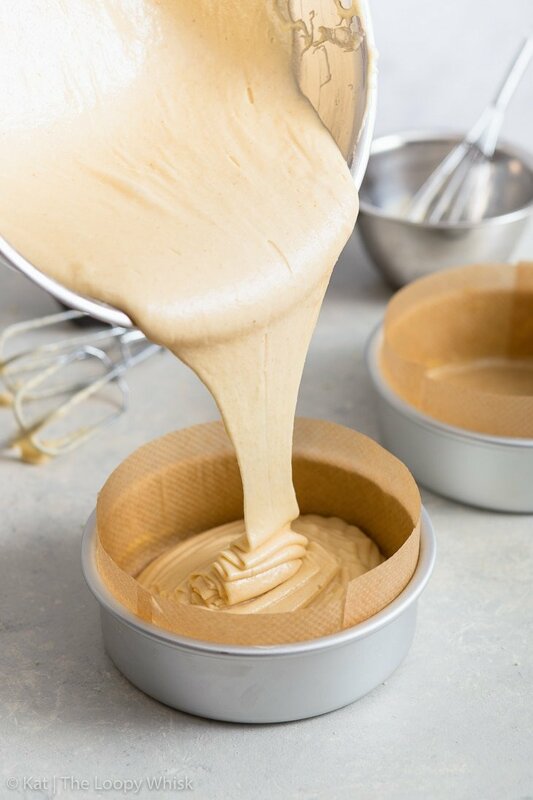 Evenly distribute the cake batter among the three lines cake tins and smooth out the tops. Bake in the pre-heated oven at 355 ºF (180 ºC) for 40 - 45 minutes or until an inserted toothpick comes out clean and the cakes are golden brown on top. Leave the cakes to cool in the cake tins for about 10 minutes, then turn out onto a cooling rack. Once cool, level off the cakes if they have domed while baking (the cut-offs make for an excellent snack). First, brown the butter by first melting it in a pot with tall sides and then cooking it for about 10 - 15 minutes with frequent stirring, until it goes a deep brown colour and starts smelling nutty. The butter will foam, so make sure you use a deep pot. Once the butter goes a dark brown butter, remove it from the heat immediately (otherwise it will burn) and pour it into a mixing bowl. I recommend using a pot with a light-coloured bottom so that you can follow the changing colour of the butter. Allow the butter to cool at room temperature or in the fridge until it firms up but is still "spreadable" (see post). Whisk the cooled and firmed-up brown butter until pale, fluffy and increased in volume. Add the powdered sugar and whisk for a further 4 - 5 minutes until the frosting is smooth and super fluffy. In a pot, melt the sugar on medium-high heat while constantly stirring, until it is a deep golden brown. Add the butter, and mix well until the butter has melted and is fully incorporated into the caramel. (Be careful, as the caramel can bubble strongly on the addition of butter!) Allow to cook for 2 - 3 minutes. After the final addition of the double/heavy cream, add the salt and allow the salted caramel to cook for 1 minute, then remove from heat and allow to cool completely. Place the popcorn into a large bowl or onto a large baking sheet lined with a silicone mat or aluminium foil. In a pot, mix the sugar and water, and cook on medium-high heat while constantly stirring, until it is a light amber/golden colour. Don't let the sugar go all the way to a deep golden brown. The reason for adding the water here (unlike for the salted caramel sauce) is that we want a more controlled caramelisation of the sugar, as the caramel can burn quickly once the baking soda is added. Add the butter, and mix well until the butter has melted and is fully incorporated into the caramel. (Be careful, as the caramel can bubble strongly on the addition of butter!) Allow to cook for about 30 seconds. Add the baking soda and mix quickly – the mixture will bubble up so be careful not to burn yourself. Quickly pour the bubbling caramel over the popcorn and quickly mix the popcorn + caramel together. Working fast is crucial at this stage, as the caramel gets hard very quickly, and we want all the popcorn covered in an even thin layer of caramel. Allow the caramel covered popcorn to cool, then break it up into smaller pieces. 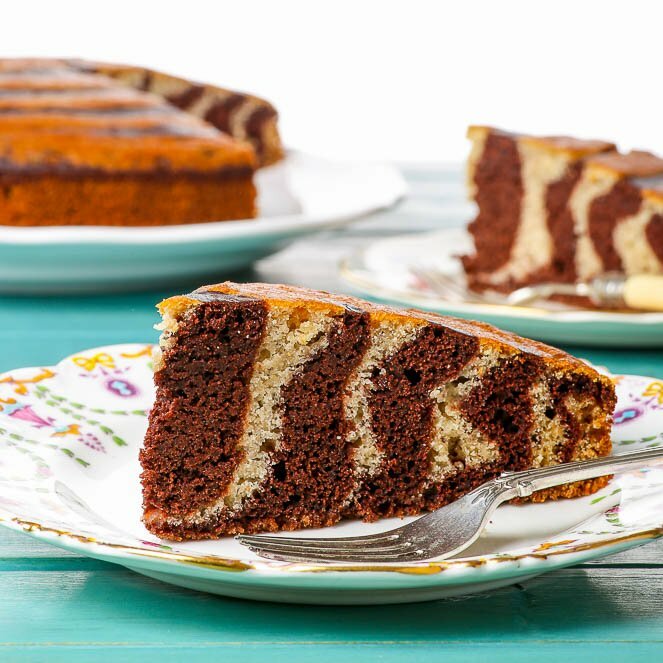 Assemble the cake by spreading a generous layer of brown butter frosting on top of a peanut butter sponge. Drizzle with some salted caramel. Then repeat with another layer (see post). Place the third and final peanut butter sponge of top. Use the remainder of the brown butter frosting to cover the top and sides of the cake. Smooth out the frosting with an icing smoother. Refrigerate the cake for about half an hour. 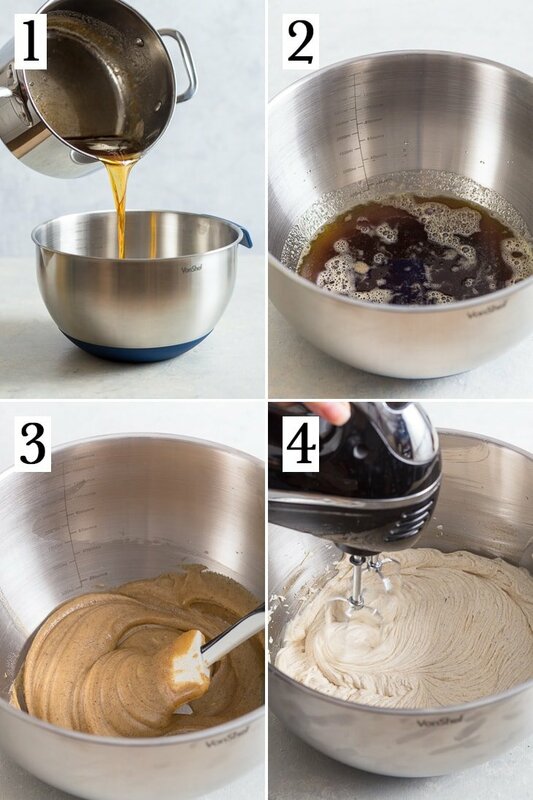 This will firm up the frosting and ensure that it will stay neat once the salted caramel is drizzled on top. 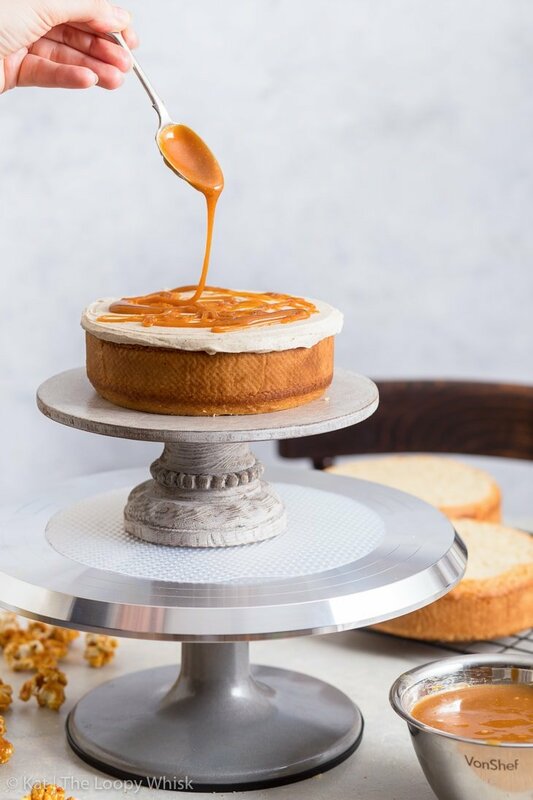 Spread the salted caramel on top of the cake, and allow it to drip down the sides. 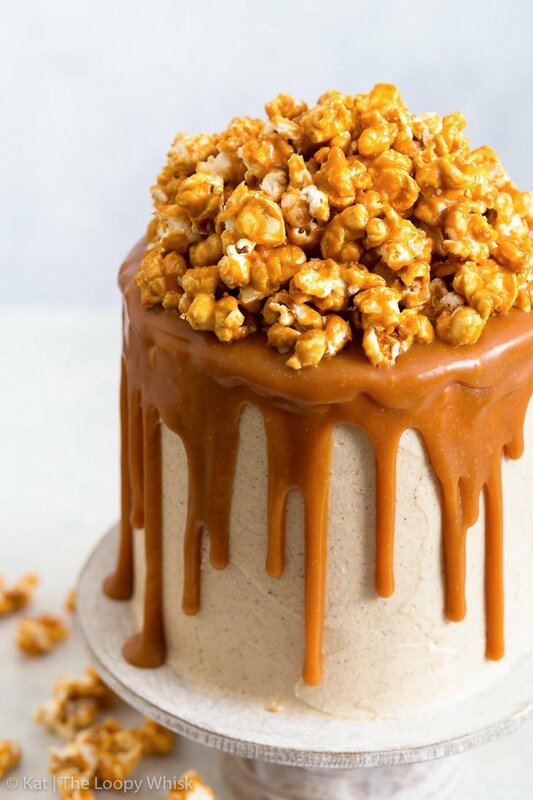 Pile the caramel popcorn on top of the cake. Use the salted caramel to stick the individual pieces together (to make it more stable). The salted caramel peanut butter cake keeps well in the fridge in a closed container (or carefully wrapped in cling film) for 3 - 4 days. 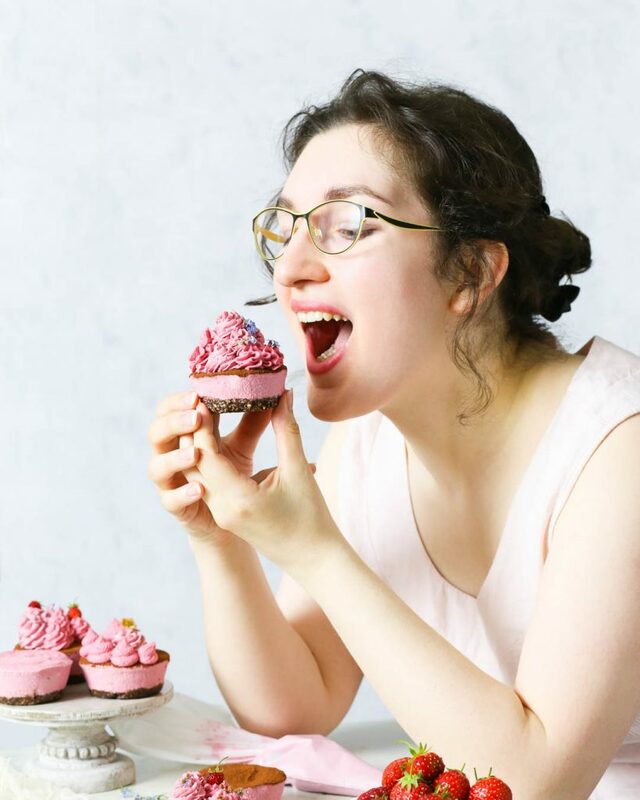 Looking for more spectacular gluten free cakes? 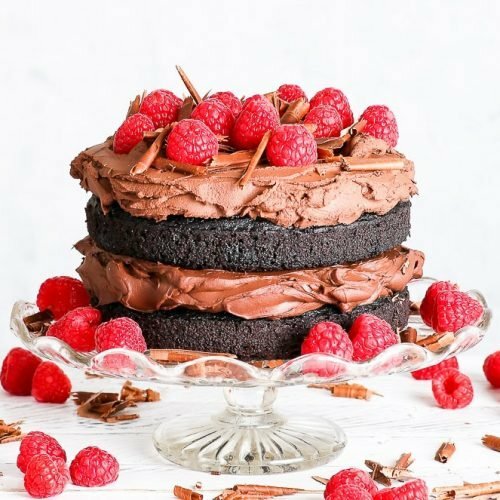 This cake is just BEAUTIFUL! Looks absolutely delicious too! Kat, hi! The cake looks amazing! I would like to make it. Could you please tell me what flours did you use for the GF flour mix? Or you use the store bought one? Hi Marina! 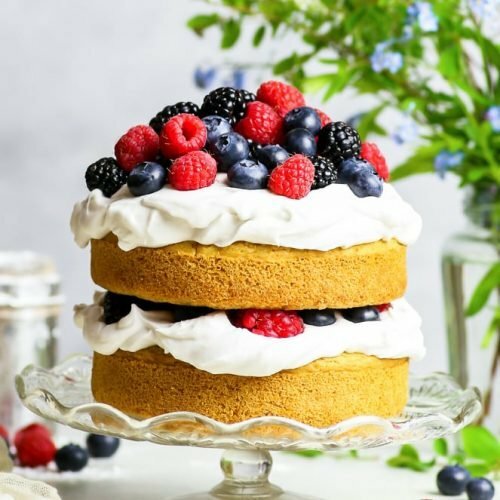 So glad you like the cake 🙂 I use a simple store-bought GF mix containing only rice, potato and maize flour with no added xanthan gum (it’s from Lidl UK “Just Free”).